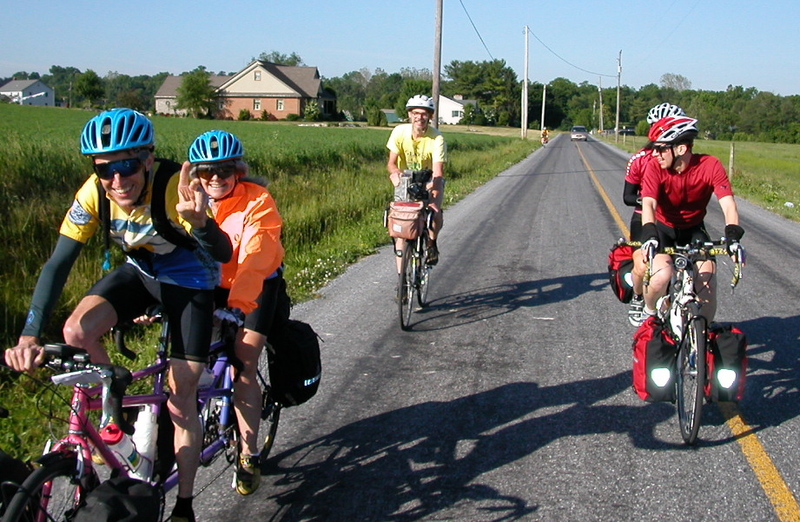 Recently, I was combing through some old ride reports and came upon a piece I had written from 2005, which was my first year of randonneuring. In it, I talked about my impressions of that first year of training and riding with Ed, the D.C. Randonneurs, and Chuck and Crista’s weekend century rides. Even though I still feel like a relatively inexperienced randonneur, I had forgotten what it was like to be truly “new” to randonneuring like I was in 2005. Over the past year, my boyfriend Ed and I rose many weekend mornings to ride on his tandem bicycle with a group of cycling friends. Overall it was a great year of riding, though there were some moments of inner turmoil. Below is my summary of 2005. Felkerino’s signature shot on a 2005 brevet. The alarm usually jolts us awake by 5 a.m., and we tumble out of bed, grabbing desperately for our coffee, sunblock, and bag balm. Yes, this is our leisure time, but Ed and I take our leisure time very seriously. We snarf down our breakfast, load up the car with our pre-, during-, and post-ride accoutrements, the bike is positioned and secured on the roof rack, and we begin the drive to the ride start. Ed comments enthusiastically about how much he loves his Honda, how quickly it heats up, and how great his stereo system is. He then chats about how great the ride will be, how we are going to have a great ride, and how much he loves riding his bike. Felkerino and I have rather juxtaposed energy levels at this time of the day. He is a babbling brook of enthusiasm and I am a glacier of resistance. He often remarks about my lack of verve for doing the ride, that all I will say is, “well, it is sure cold outside, or it sure is early.” But my sleep is like a spider web, and when I wake up in the morning I have to sweep away the spider web before I can substantively comment or get excited about anything. The roads to the ride start are quiet at this hour, and despite my catatonic state, Ed and I both love the camaraderie of drinking our coffee from our travel mugs as we leave the sleepy city of Washington, DC and head for the country. Upon arriving at the start, we peruse any cars that have preceded us and say our hellos. This helps spark my enthusiasm, and I throw on my gear while Ed takes the bicycle down from the rack. We fill our pockets with power gels, money, and other assorted goodies, and get ready. Starting out is tough. I enjoy the cozy car, and my body also believes that anytime before 8 a.m. is a good time to be sleeping. But that philosophy does not mesh with this group (or at least, with Ed). Randonneurs are more of the mindset that if there are twenty-four hours in a day, a person should try to ride twenty-five of them. As we begin riding, I get a finer sense of the weather. During the winter the weather becomes the third person on the tandem. Although I wear adequate layers and being a randonneur means being prepared for anything—rain, snow, hot weather, sometimes all in the same ride– it is still a shock to my system to be “warming up” with frigid air enveloping me. I am grateful to have Ed as my draft when we ride the tandem. I think perhaps this is his penance for converting me into a randonneusse- taking the full brunt of the elements. We pedal on, and the riders settle into their pace. Everyone seems to have strengths that play out at different segments of the ride. For some, it is the ability to climb hills. For others, it is their consistent pace of riding. Some have great endurance, and some riders seem to be full of nothing but strengths. As a fairly new rider, I am still waiting for my strengths to become apparent, so at this time I find my strengths to be rest stops, lunch, and ending the ride with a smile. These things I do remarkably well. Riding with a group so frequently sometimes invokes my unhealthy tendency to compare myself to others, and throughout the year I found myself coming up short. Everyone else is faster, everyone else looks better on the bike, everyone else is more athletic, and everyone a stronger rider than I am. Around the 60-mile mark of almost every ride, I settle in and get a sense that all will be well. Perhaps my body has simply stopped fighting and is now resigned to its fate of riding on, but I like to think it is that I begin to enjoy the experience. I become aware of how strong I am to be able to ride my bicycle as far as I do. I am grateful to be healthy and have good people like Ed, Andrea, and the Chuck and Crista group to ride with me. 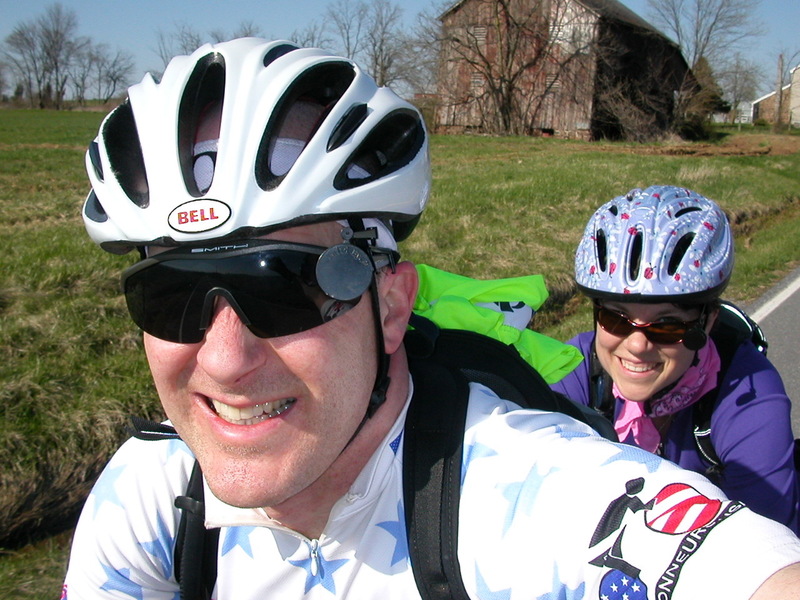 I think about all the time Crista spends looking out for us, cuing routes that fully integrate me into the beautiful areas just outside of Washington, DC, and how I am becoming a part of a warm and spirited bicycling community. I realize that everything is ok. It’s bike riding, and it is fun! Whenever I finish a ride I feel that I am one step closer. One step closer to being able to ride 100 miles or a long brevet without suffering. One step closer to acclimating to 5 a.m. wake-ups. One step closer to seeing and feeling more of the world on my bicycle, and one step closer to being comfortable with myself as a rider. The journey is proving to be a difficult one at times, but this ultimately optimistic and accomplished sensation that embraces me at the end of rides keeps me coming back weekend after weekend. By the way, I don’t eat Little Debbies anymore and Ed is no longer my boyfriend. Also, I still have some coffeeneuring posts in the pipeline. However, I found myself in a reflective mood today. We’ll be back to more coffeeneuring rewind next week. Yippee! Ha ha! I thought for sure I had since I liked eating them so much in 2005. Maybe I do secretly long for them! “my body also believes that anytime before 8 a.m. is a good time to be sleeping.” I can totally relate to this! Thanks very much for this post– from where I stand, you’re a seasoned ancienne, but everyone had to have started new at some point, so a post like this encourages me to keep riding and keep learning. Thanks, Lisa. I enjoyed taking this walk into the past and I’m glad you found it encouraging. See you soon! Although you were no slouch at the keyboard in 2005, it’s great to see how your writing style has developed over the years and kilometers. Carry on!